6 Stunning Industrial Chic Wedding Venues in Calgary | Wedding Ideas ARE YOU A VENDOR? Hunting for a stunning industrial chic wedding venue in Calgary? Here are a few of our absolute favourites. 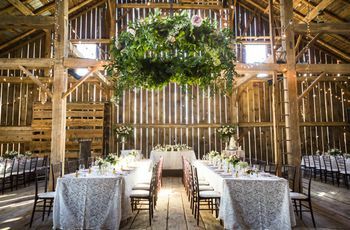 If the Pinterest board for your big day is filled with loft spaces, exposed brick and wood and metal decor, these industrial chic wedding venues in Calgary are worth checking out. They’re a bit edgier than your average ballroom or function space and will give your wedding that ultra-cool vibe you desire. P.S. if none of the spots on this list fit the bill, check out these awesome Calgary brewery wedding venues - they’ve all got an industrial feel and are a bit more laidback. 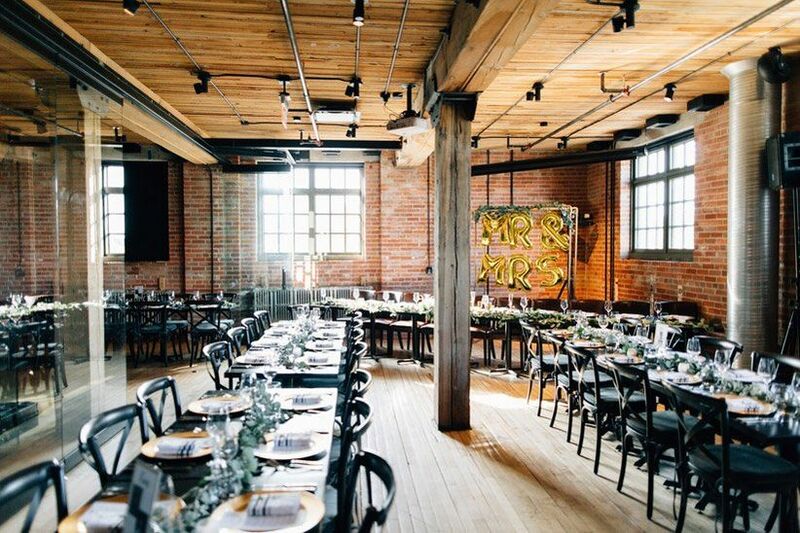 Here are a few stunning industrial chic wedding venues in Calgary. 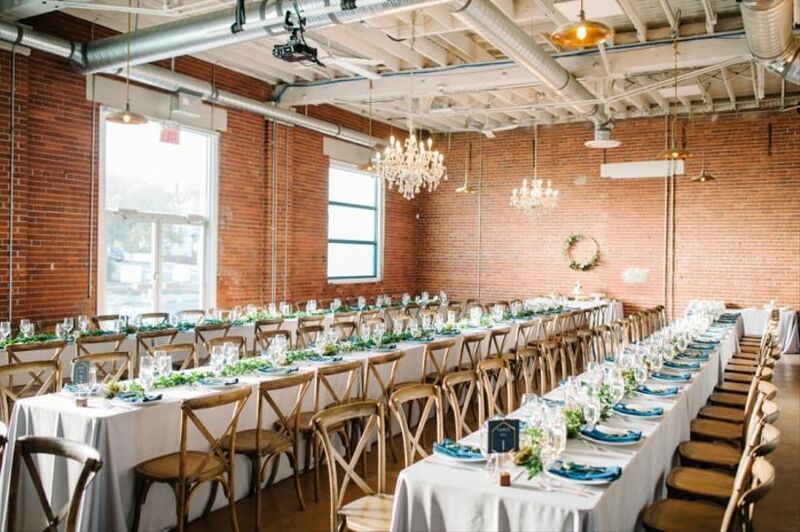 The Commons is one of the most popular industrial chic wedding venues in Calgary. Inside you’ll find three unique event spaces - The Parlour Room, The Commodore Room and The Hemingway Room - all of which flaunt exposed brick walls, high ceilings, visible ductwork and shiny concrete floors. Whether you want to roll with the industrial style for your decor, keep things minimal or do a little juxtaposing with elegant chairs, linens and arrangements, you can make your wedding dreams come true here. The largest space can fit up to 175 guests, so it’s the perfect pick for a midsize wedding. 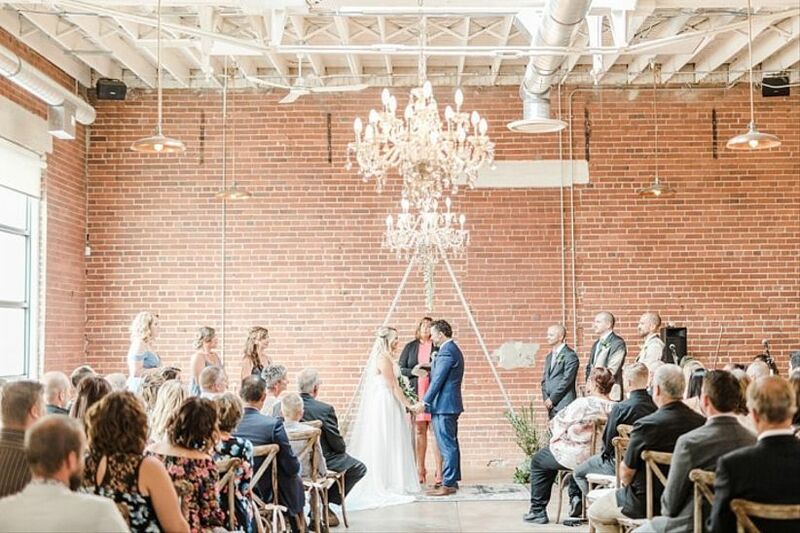 Dreaming of an industrial chic restaurant ceremony and/or reception? Charbar will be right up your alley. 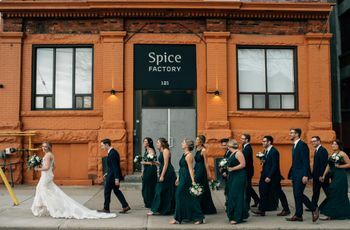 This Calgary wedding venue is tucked away inside the historical Simmons Building, a former mattress factory, and offers a super stylish place for your ‘I dos’. It still has many of its original features, like exposed red brick walls and multi-pane factory windows, so you won’t even need to add something old to your ensemble (it’s built right in!). 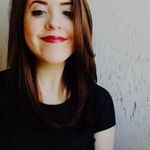 The event space has a capacity of 550 events, but can be reconfigured for smaller events, if you’re in the market for something a touch more intimate. Calling all thespians! 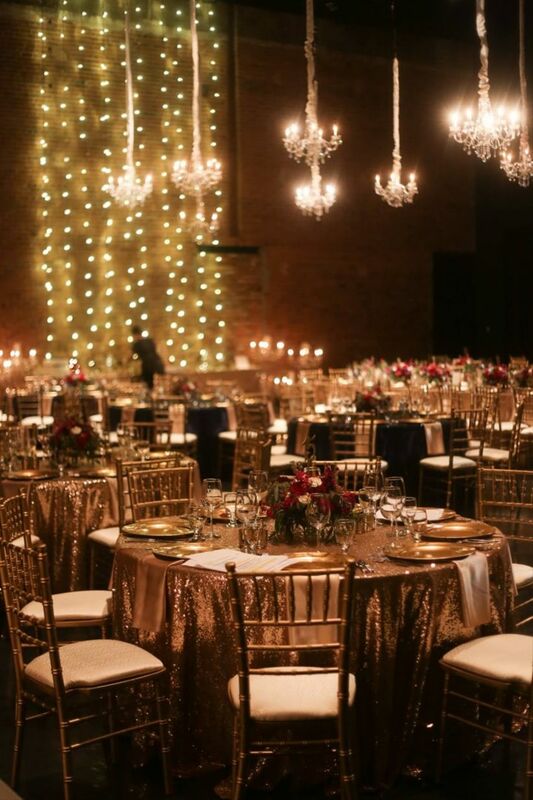 Theatre Junction is equipped with many wedding worthy spaces, all of which have a unique, industrial twist (think high ceilings, exposed bricks and all the other hallmarks of an awesome loft space). If you’re having a large wedding, the main Flanigan Theatre is the spot for you (it can fit up to 500 guests), but if you’re going with something on the small/medium side, you have your fair share of options. If you want to give your celebration an artsy twist, this is the industrial chic wedding venue in Calgary for you. 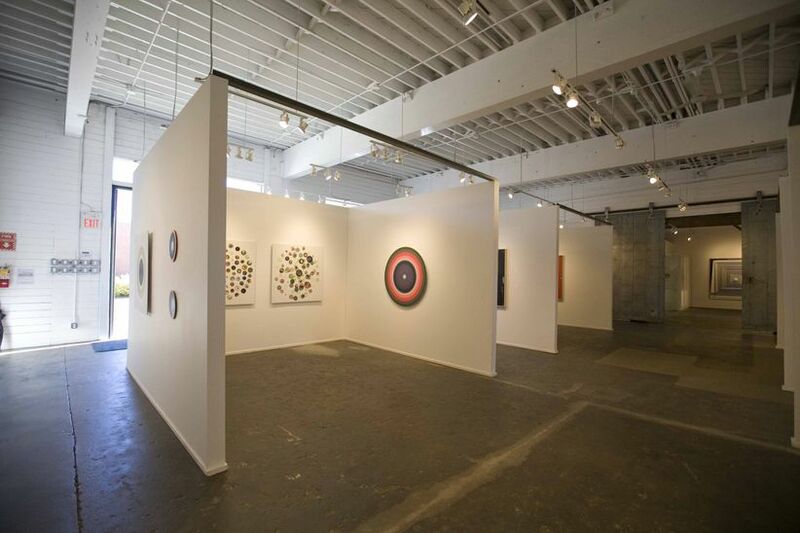 The super sleek gallery space is a blank canvas just waiting to be transformed into your dream wedding backdrop. 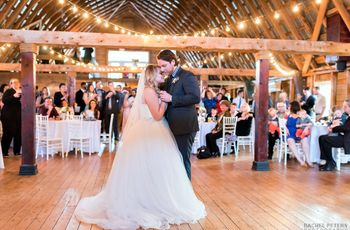 It has white walls, distressed concrete floors, floor-to-ceiling windows, salvaged metal doors and enough space to fit up to 80 guests (so don’t go to wild with your plus ones). The University of Calgary is more than just a place for studies, seminars and lectures - it also makes for an awesome wedding venue. There’s no shortage of function rooms to choose from here, but if you’re on the hunt for an industrial chic wedding venue in Calgary, the Energy Environment Experiential Learning space is the place for you. It's definitely a bit more modern than the brick and beam spaces on this list, with all-white decor, sleek concrete floors and walls and wooden accents. It has enough room for 360 guests, making it a great option for larger celebrations. 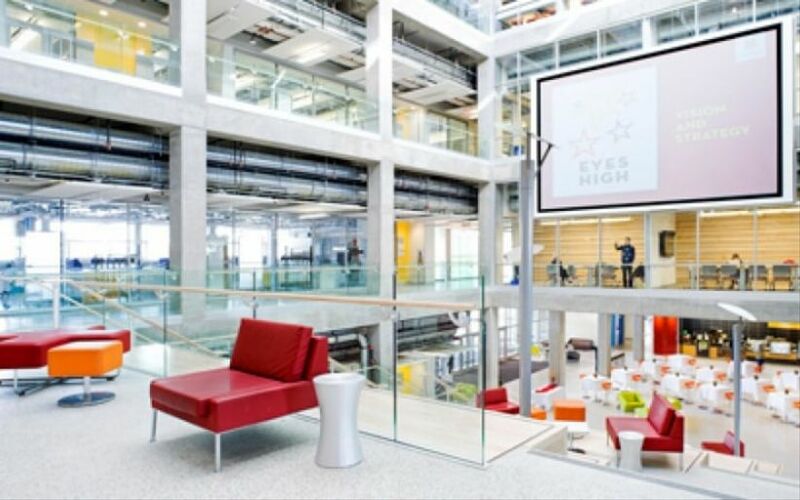 Like the University of Calgary, Skyline errs on the chic-er side of industrial chic. 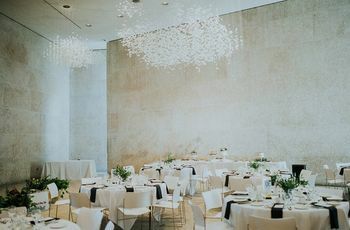 It boasts floor-to-ceiling windows, shiny concrete flooring and is pretty much a blank canvas (so you can easily decorate it to fit your dream wedding theme and colour scheme). Still not sold? 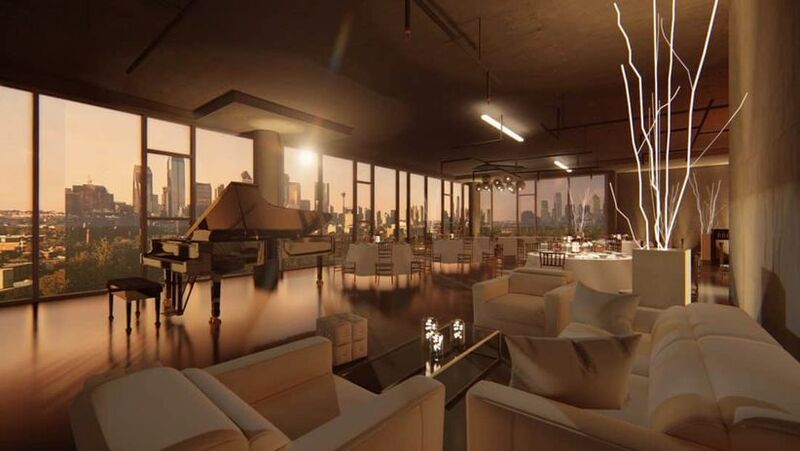 Thanks to its spot on the fourth floor and its huge windows, you’ll get stellar 360 degree views of the city, which is picturesque in the day and after the sun goes down. It can accommodate up to 300 guests, so you can get away with adding a few extra names to your guest list.